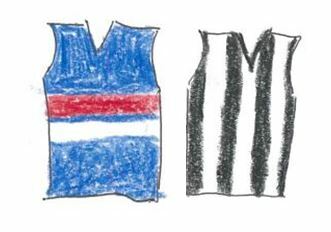 When the draw came out, I had pencilled in attending this game as I can hear the Whitten Oval siren from our home. On match day, I was feeling exhausted and lethargic and had nearly decided to not go, the option of being able to stay home and flick between the footy and the Pune test match being very alluring. 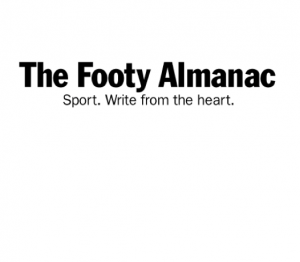 I then read an excellent article on the Footy Almanac site about the women’s league by Annie Myers. I am a keen supporter of AFLW, and thought that I better act upon my support by again getting along. Remarkably, my partner Sandra was again happy to attend. She’s no fan of footy but she is an ardent people-watcher and lover of festive occasions and had thoroughly enjoyed the season-opener against the Blues. The festive atmosphere was again both striking and distinct from the more corporate, and tense atmosphere of the men’s game. On a cool February evening, 6733 turned up and made a lot of noise to see the Dogs, seeking to stay in the flag race, take on the winless Pies. Footy being a tribal activity, people do care who wins, but the overall mood is of celebration, at least partly of the opportunities afforded and created for women and girls. The Whitten Oval offered its traditional strong breeze straight down the ground towards the Barkly Street end. The Whitten Oval’s Wikipedia entry notes that “The ground is known for being particularly long and narrow with deep squarish pockets, and for the wild wind which often bellowed over the ground, particularly at the Geelong Road end. These reasons, most specifically the wind, meant that the Western Oval was the site of many abnormally low scoring games, inaccurate scoring tallies and games where more than 80% of all scoring was kicked to one end.” It is telling it how it is! The Pies had first use of the wind and our quarter-time 5 point lead looked decidedly on the skinny side. After our much-maligned marquee forward Mo Hope got us on the board with a dubious free kick, the Dogs had the better of a scrappy high-intensity contest and created at least as many scoring opportunities. The second quarter continued as a tight and scrappy contest, with the Dogs’ dynamic midfield duo, Ellie Blackburn and Emma Kearney, outstanding. They struggled to convert their midfield dominance, partly due to the absence of their skipper and best forward Katie Brennan and partly due to the dogged defence of the Pies, led by Meg Hutchins. The terrible knee injury suffered by Pie Kate Sheahan seconds after she entered the field for her debut game soured the quarter. The third quarter is often dubbed the premiership quarter, and while neither of these sides will win the inaugural premiership, this quarter determined the match. The Pies, whose difficulty scoring has characterised their campaign thus far, kicked four by breaking even in the midfield (with Alicia Eva going head to head with Kearney), applying enormous forward pressure and making the most of their opportunities. The play of the match came midway through the quarter. The Dogs tried to clear the ball out of defence along the boundary line. The Pies’ Jess Cameron made great ground to make a contest, forced an error, then made second and third efforts to paddle the ball along the boundary, gain possession under pressure and handball to Eva, who converted. Jasmine Garner was a presence forward all match and kicked two, and the Pies looked on the cusp of breaking the ice when they led by 22 points at the last change. The last quarter started poorly for the Pies with the Dogs immediately scoring a goal both making the deficit seem feasible and getting the crowd roaring. The Dogs continued to attack but lacked marking targets up forward and kicked a string of behinds from shots on the run. When they eventually scored another goal there was over 7 minutes left on the clock and the difference was 7 points. The 2 points that the Dogs had scored into the breeze in the first quarter remained as the only scores for the match at the Geelong Road end, so the Pies were under siege and looking decidedly vulnerable. The Pies managed to turn around the game in those remaining minutes. They got numbers to contests and won or neutralised contests that the Dogs had won and run from in the first half of the last quarter. When they won the ball, the Pies very successfully ran down the clock through strings of short passes to uncontested marks, frustrating both the Dogs and their supporters. The final siren saw an explosion of joy and relief for the Pies, who had managed to keep the game scoreless for those final seven minutes. They had also been aided by the Dogs’ inaccuracy early in the last quarter. The other explosions came from the post-match fireworks display, which made a very nice backdrop to our short walk home. I am a big fan of the AFLW, and think that the standard has already improved and will continue to get better. The players have had four weeks of competition and one pre-season at this level and I think that people comparing the standard to the AFL men, or any men’s competition, are missing the point in terms of preparation and opportunity. A national women’s competition is offering spectators high-intensity competition in a free, festive, angst-free environment. To participants and potential future participants, it is offering opportunities to participate that have previously been denied by one thing, gender. If yesterday wasn’t the time for it, today is. As for the Pies, having seen them twice live now, they look like a team that is very competitive at the contest but lack some run, spread and precision going forward, and they will need to address these needs in their recruiting for 2018. Speed and precision of ball transition is the modern game, and is even more critical in 16 a side. They also need some more forward options, although I don’t think that their preference to play a spare defender helps their forwards much. My other observation is that the Pies need to develop a home ground. This game had a strong sense of home for the Dogs, including fireworks being shot off after each Dogs’ goal and the usual parochial PA spruikers during the breaks. The Pies’ home games have so far had to be switched to Ikon/Princes Park and have lacked any sense of “home”, especially against the Blues. The Olympic Park venue appears to be too small and my father would turn in his grave, and a few of us might go to early graves, if a Pies team regularly played home games at Carlton. Victoria Park seems the obvious solution, the spiritual and traditional home of the club, but I understand that there are issues to be sorted out with Yarra Council. Make it happen, people (at both the club and the Council). This competition has energy and a future and this team needs a home ground. Go Pies! Well done Steve and welcome aboard to women’s footy. It’s been so great I am already sad at its imminent end of season…. thanks for piece.